“Most gas stations have tyre pumps with a pressure gauge,” said Rosh, "although pumps and gauges at different stations can look quite different." "I prefer to fill up air and check the pressure at petrol stations where the pressure gauge is up on the wall, and not on the filling tube itself, as I've found them to be more accurate." "Some people rough handle the gauge that is on the filling tube beside the nozzle and able to be carried near the tyre, leaving them around or throwing them out of the way after use, which can reset their 0 reading to something else and cause them to give inaccurate pressure readings." "You can also buy a cheap mechanical air pressure gauge easily from shops these days, and use them instead. If you do, you also don't need to go to the pump every time you want to check tyre pressures. It allows you to conveniently check the tyre pressure no matter where you are." "Always check the tyre pressure when your tyres are cold, as pressure increases when the tyre becomes 'hot' from driving even a mile. If you have to drive some distance to get air, check and record the tyre pressure first, then add the appropriate air pressure when you get to the pump." "It is normal for tyres to heat up and the air pressure inside to go up as you drive. Never 'bleed' or reduce air pressure when tyres are hot." "First, remove the dust cap from the valve on one tyre. Keep the cap safe, so you don't lose it. If the tyres were cold, firmly press the tyre gauge onto the valve and take a reading. That's all there is to it!" 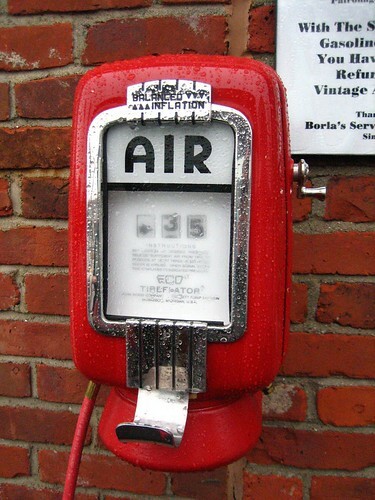 "You can now fill air to achieve the recommended air pressure. If you overfill the tyre, release air by pushing on the metal stem in the center of the valve with a fingernail or the tip of a pen. Then recheck the pressure with the pressure gauge." "Repeat the filling and checking process if needed. Replace the valve cap, once you are satisfied that the tyre is correctly inflated." "Now visually inspect the tyre to make sure there are no nails or other objects embedded that could poke a hole in the tyre and cause an air leak. Check the sidewalls to make sure there are no gouges, cuts, bulges or other irregularities." "Repeat this process for the other four tyres, including the spare tyre in your boot. It is easy to forget what is out of sight, but you never know when you might need it. Note that some spare tyres require higher inflation pressure." “These days, you can also enter your car registration number at various reputable online sites to get the correct tyre pressure for your car. Different countries have different sites. In New Zealand, try energywise.govt.nz/tools/tyre-pressure." “If you’re ever unsure what to set your tyre pressures to, look for this information on a plate or sticker supplied by the car-manufacturer inside the driver’s door pillar, driver's door sill, glove box, fuel filler cap, or under the bonnet. You should also find the car manufacturer’s recommended tyre sizes here." "According to Goodyear, air pressure in a tire goes up (in warm weather) or down (in cold weather) by 1–2 pounds for every 10 degrees of temperature change."